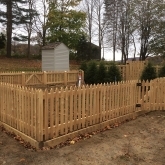 At Roots Landscaping we have a team of professionals with experience on dozens of fencing projects in the New Milford area. Maybe you have even seen our previous projects when driving around the New Milford area? If so you should know that we pride ourselves on the incredible quality of our fencing work. Our service is among the best in New Milford and Connecticut as a whole and we are capable of handling any job large or small. Do you want a fence for privacy, keeping children and pets safe, or something else entirely? Either way Roots Landscaping is the answer to your problem. 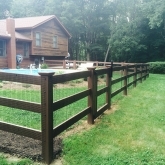 Each New Milford customer is provided with high-quality, tough fences by our fence partners. Interested in our fencing projects? 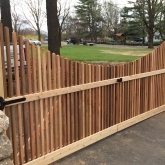 Visit Roots Landscaping Fencing for more details. Installing a fence on your own is difficult and you will often run into unexpected problems. It is always best to get professional to help and luckily for you we are professionals. If it’s a fence we can probably install it. We like to start our work with you by picking a fence to match your property. This means we measure the yard and check your terrain to decide the fence that best matches before installing it safely and securely. 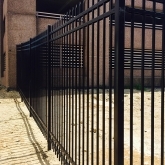 The cost of the fence can vary based on a couple of factors, namely the height of the fence, type of fence, and amount of material needed. Already own a fence in New Milford but it’s starting to fall apart? We can help with that too. Our expert employees are adept at finding the source of the problem and preparing a solution. One common problem many fences face is wood rot. This occurs when fungi gets into the wood. Once in the wood they eat away at it and cause decomposition. Thankfully we at Roots Landscaping have dealt with this problem before and are the best New Milford contractors for the job. Often we’ll need to chemically treat and patch the wood in order to restore it and prevent it from rotting further. Afterwards we can repaint or stain it. In some cases where the rot is too developed to treat we will replace it for you. Another risk is that the fence poles shift over time. Since these poles provide much of the structural stability a shift in them can collapse large stretches of fence or cause it to deteriorate. 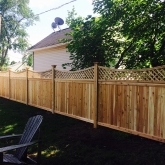 If they are repaired or replaced this can be avoided, extending the life of your fence. Luckily we offer these services as well and are your best New Milford solution. Many fences also have problems with holes or cracks. The procedure for repairing these differs by fence but we can repair these for you regardless. It is suggested you repair and fill these cracks and holes as soon as possible to keep the fence in good shape. Another common problem we encounter are fences that have missing boards. The biggest danger with missing boards is that the fence could collapse, which will necessitate more expensive repairs. 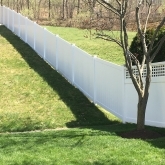 The type of fence, its height, and its length causes the repair process to differ between fences. 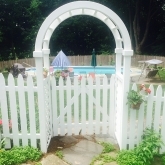 However, if you give us a call here at Roots Landscaping we can tell you how to repair it and provide a cost estimate for your New Milford fence. Roots Landscaping offers the best repair services in New Milford, CT. If you’re interested please give us a call at 203-304-7326. If you’re not sure what you need feel free to call and our expert employees can help you decide. 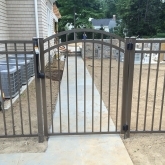 We can also help you with your masonry or landscaping needs in the New Milford area. Roots Landscaping is accredited by the BBB standards. To learn more about how we can help you with all your outdoor upgrade and maintenance needs, or if you’d like to learn more about our company, team members and services, contact Roots Landscaping today at 203-304-7326.